05 workstation Ready To Move Center Available for rent only 45000/- Rs. in Pune Vimanngar 7096003954. 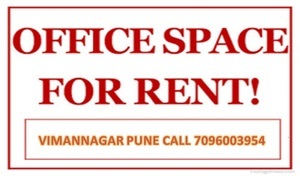 A commercial complex with a refreshing perspective in architectural planning located Pune vimannagar , A commercial office space fully furnished with reception , Minimum 5+ work stations , Par Workstation Rent Rs 9000/- Par month , with computers , light bill , Net bill , Ac bill , Conference room , canteen , facility management staff , housekeeping staff , support Staff , IT manager , server room , Washroom , over looks main road, The premises can be furnished as per client choice, 24 hrs. Water, and Parking for two wheeler & four wheeler are available. Nearby all energies and public transportation, excellent locality, and the building is the best commercial building on excellent location, secured area and more. Call at Trupti - 7096003954 for more information. Maintenance Charge- including on rent.